As a born-and-reared New Yorker, Georgette Farkas knew immediately where she wanted to open her first restaurant: Manhattan’s Upper East Side. Rôtisserie Georgette, slated to open tonight, boasts a menu full of roast meats, luscious sides and classic French desserts. 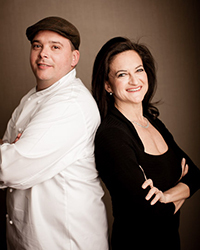 Farkas, who spent years cooking professionally before she became Daniel Boulud’s public relations and marketing director in 1995, oversaw the entire design and construction of the restaurant. For her first solo venture, she brought back antique finds from France, scoured estate sales and unearthed hand-painted azulejo tiles from her parents’ travels. Read on for Farkas’s inspiration, design process and what she learned from Boulud. Why did you choose a rotisserie as the focal point of the restaurant and menu? It all comes down to simplicity. Having worked in some of the most complex restaurants that exist, I was relishing the idea of doing something seemingly simple, and yet knowing very well that making it look simple is of course very difficult. Our guests will already know why they’re coming: They know that they want to have that nice piece of roast lamb, chicken or a whole roast pig. And I think that the rotisserie itself is on the one hand very simple, but on the other very sensual: Seeing meats being roasted over an open flame, your mouth is watering. The menu overall is very straightforward, there’s nothing newfangled or reinvented. Just nice, homey, satisfying stuff, which is pretty much what the whole restaurant is about, with a little bit of sophistication, of course. After working with Daniel Boulud for so many years, is there anything in particular that you took away from that experience? First of all, team, team, team. Surround yourself with the most talented, motivated, driven people you can find. A typical Daniel Boulud approach is that you can always do more and you can always do better, and you’ve never done well enough. I’m sure there are a million more lessons from him; he would hate no tablecloths and no placemats. But he definitely would have put down carpet for the noise; noise and comfort is always a priority. Tell us about the restaurant’s design. Everything here has a root in history. We’d like to think that we put here things that could have or should have been here. It’s a landmark building and was constructed in 1903. But when I found the space, it was just a dusty white box. It was also very important to me to find craftsmen from around New York. The crown molding was made by hand by this lovely Hungarian man in Long Island City, with a beautiful studio overlooking Manhattan. The parquets de Versailles floors are brand-new as well. They were handmade by an Armenian family in the Bronx, and we loved their work so much that we also had them build the cabinetry. Where did you find the furniture and other decorative items? I brought a number of things back from France, like the cabinet at the host stand and a shelf in the private dining room. I also knew I wanted to have an open kitchen, but I wasn’t sure initially how to tie it in with the dining room. I had traveled to Portugal years ago and fell in love with the azulejo tiles, and I was almost ready to purchase some, and my mother said, “No you can’t buy those—your father and I bought crates of them in 1968 on a trip to Lisbon!” And what’s even more uncanny is that my father had bought this tile butchering mural and these hanging birds. It was kind of eerie, almost as though it were meant to be. It was also very important to me to have a mix of old and new items: For example, the tables are acid-washed steel, but I also had a silver dealer find vintage English silver with all different monograms or coats of arms. Did you work with a professional designer, or did you come up with the designs yourself? I created this restaurant from soup to nuts, but I had a secret weapon. When I got started, I had a very specific vision of colors, of designs, of materials: I knew I would have bronze sconces, I knew I would put up baldaquins (canopies), I knew I would have Louis XVI–style banquettes. But I also knew that I was not a professional designer, and there are a lot of technical things that go into building a restaurant that I didn’t want to screw up. Luckily, a family friend and professional designer, Alexandra Champalimaud, offered to help me on a sort of “lifeline basis.” Every couple of weeks, when I was getting further along, I would call her and say, “Here’s what I’m doing, what do you think?” and she would send me her feedback. For example, I knew I wanted the tiles around the opening of the kitchen pass window. She has the boldness that comes with the confidence of being a professional, and she said, “No, do the whole wall!” I would never have done that on my own. I also have a friend named Charles Jouffre, who makes furniture for Versailles and the Paris Opera. I sent him my sketches, and he created the two canopies over the banquettes. They’re made out of burlap—they’re sort of rough and refined at the same time. Why did you decide on the Upper East Side for the location? It’s where I was born. Go where you know, as they say. I’m comfortable here, I feel I understand the culture of this neighborhood, that I know the desires and tastes and habits of the clientele. Was this space your first choice? I looked at many other spaces but this was one of the early ones, and it took my breath away when I first saw it. There was nothing here, and specifically there wasn’t a restaurant here before. You have to build an exhaust system up 17 stories and dig plumbing into the ground, and it’s expensive, complicated and time-consuming. It’s much easier to find an existing restaurant and make some aesthetic changes, but I’m glad I did it. I didn’t think I would ever be able to afford this space, but after I walked past while out to dinner I had to come back during the day. The landlord just happened to be there, and somehow it was meant to be. Is there karma? Maybe, but really, you make it happen. It’s nice when somehow good luck puts you in the right place at the right time, but then you make it happen.